With beautiful flowers and community traditions, Volunteer Park has been an open space treasure on Capitol Hill for more than 100 years. 2012 is a busy year for the park — a playground overhaul starts soon, admission prices start at the conservatory in January. Bigger challenges loom. A new group has formed to help care for and shape the park for the next 100 years. Bayley is helping lead the newly formed Volunteer Park Trust to help a diminished Seattle Parks care for the public space and help keep it active and full of people. Challenges loom. Bayley rattles off a roster of upcoming change slated for Volunteer Park. The 1933-built Seattle Asian Art Museum will go through a long closure in coming years as a massive seismic and infrastructure upgrade is completed — no specific timetable yet, an official said. By 2014, the deadline for either decommissioning or lidding the Volunteer Park Reservoir will require a significant planning effort. A push for streetcar service to reach closer to the park’s borders is in the offing. Meanwhile, the city budget for maintaining the park becomes more and more constricted. Bayley, who lives two blocks from the park and is serving as chair of the trust, said there are other groups who have rallied around specific elements or the history of the park. The Volunteer Park Trust, he says, is focused on the park as a whole and on helping it move forward as a public space. The park’s connections in the north of Capitol Hill are solid, Bayley said, but he wants to forge a stronger connection with residents “from the south” who use the park now but may not see it as their own space to help shape and take care of. The effort will start with something small and simple. The group is inviting people interested in getting involved to a party to clean up the area around the park’s lilly ponds. The goal is to get a little work done and begin the process of building the trust. A gardening party to clean up areas surrounding the reservoir. PLUS Top Pot doughnuts, coffee and socializing! Please bring friends and kids. Gloves and tools will be provided, or bring your own. No gardening experience necessary. This gathering is a wonderful way to meet neighbors, help our lovely park and learn more about the exciting new Volunteer Park Trust. Gather at the Black Sun sculpture across from the Seattle Asian Art Museum. Future projects for the trust include undertaking a parkwide landscaping project based on the original plans for the Olmsted park, restoration of a “sunset promenade” around the reservoir, “tree management” to improve views from the water tower and projects to improve “lightness, openness and safety” in the park. 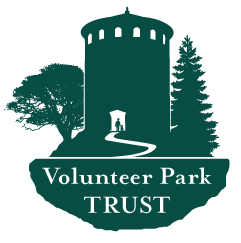 Longer term, the Volunteer Park Trust is envisioned as part of a group of trusts working together to fully utilize, protect and enhance Seattle’s Olmsted-designed parks. A combination of membership, donations and grants will power the organizations. 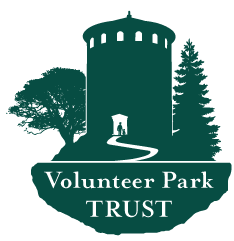 You can learn more about the trust — and donate or join — at volunteerparktrust.org. Boy, I really appreciate groups like this. Earlier this year I did a walking tour with some of these same people and was just so impressed with their passion for the park. And I love the fact that they have such a wide variety of real experts included among their core members. Very knowledgable folks. Sigh, yet another group I will need to try to find some time or $$$ to support. But I get so much value from this park, I am happy to give something back. Whence comes the 2014 deadline? I walk through Volunteer Park frequently and know it quite well. I would hardly describe it as “crumbling”….to the contrary, I think it’s in very good shape overall. The Parks Dept employees have done a wonderful job in recent years in opening up the borders of the park to its neighbors, removing non-native plants and installing new plants. Still, I appreciate the formation of this new group as I think it can only help ensure that planning issues (such as what to do with the reservoir) will be done well. I hope they are able to keep the water visible in some way. It really is pretty to look at. It’s also nice to hear the rushing water when walking around the trail along side it. I think it would look really ugly with a lid over it :( Removing it and doing some sort of in-fill with open grass, plants and trees would work better than a dome over the water. Couldn’t it be left as is? take the useless fence down, open the pretty path up! Presumably, the lid would be similar to the one over the Lincoln Reservoir in Cal Anderson park, creating more usable land, and not a dome.